Description: (Obverse) a cross pattee imposed on a wreath of laurel, with the royal crown in a circular panel in the centre. (Reverse) a plain reverse. Suspended by a ring from a plain suspension bar. Ribbon: White with blue edges and a red central stripe. Comments: This medal was introduced to replace the DSO, the Conspicuous Gallantry Medal and the Distinguished Conduct Medal. It was first awarded in 1995 and then in 1996 for gallantry in action during service with the UN Peacekeeping Forces in Bosnia. Two awards were made in respect of gallantry in Sierra Leone in 2000. 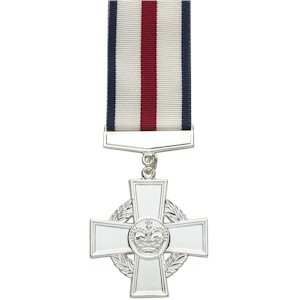 A further four awards were made for gallantry in Afghanistan between 2001 and 2003.